Viraltag, Tailwind, CoSchedule, Buffer, Hootsuite . . . I tell you what, figuring out what scheduling tool to use is almost more difficult than just doing everything manually! OK, just kidding, not really. I spent FOREVER trying to Google reviews, asking in Facebook groups, asking blogger friends. What I ultimately decided is that the only real way to know what would work best FOR ME is to just try them for myself. Luckily, most offer a free trial for this purpose. 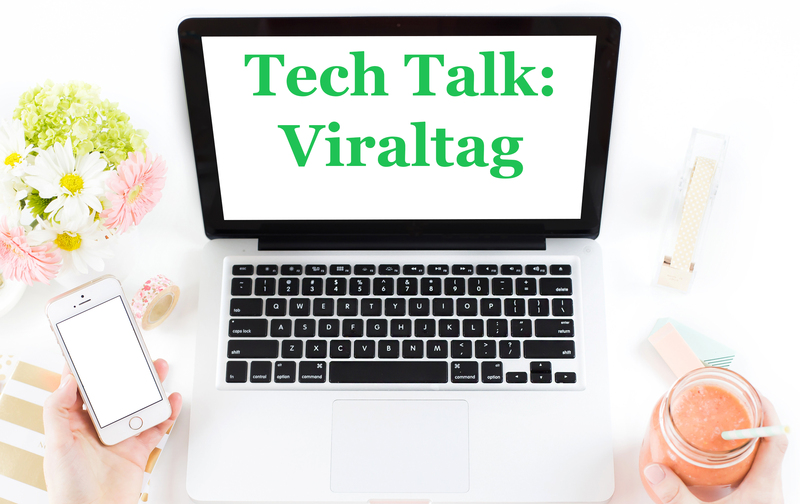 Last week I took Viraltag for a spin. Now, for a frame of reference, I normally use CoSchedule and Buffer as my primary scheduling tools. CoSchedule for my editorial calendars, Buffer for sharing other people’s posts on Twitter and Facebook. CoSchedule and Buffer work great for what I need them to do, and I have admittedly not played around with their Pinterest posting capabilities very much. I will be exploring those soon. However, neither do Instagram, and I have bumped up against pinning limits in Buffer (too many pins scheduled for the level of account that I have). So I would LOVE to find a tool that will allow me to pin to Pinterest AND Instagram. Viraltag bills itself as an all-in-one visual marketing platform. 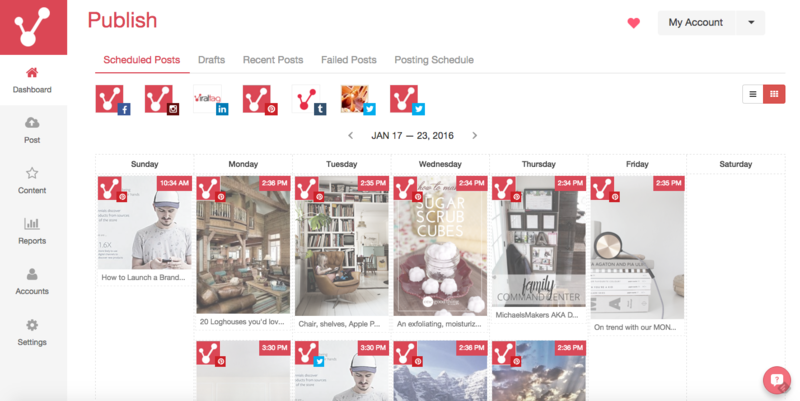 Viraltag supports scheduling to Pinterest, Instagram, Facebook, Twitter, Tumblr, and LinkedIn. You can connect multiple accounts on any social channel depending on your plan. Independent bloggers and big consumer brands are using Viraltag to execute their marketing and build their brands. Hearst publications, H&M, Lacoste, and AOL’s Style Me Pretty are just a few of the 10,000 brands using Viraltag. Viraltag is also endorsed by the Professional Travel Blogger Association and Food Blogger Pro. Simply click to schedule something you would like the share. The link is automatically included to direct traffic to the original source. You can make any edits you need to the caption. Then select the accounts you would like to post it to and the time you would like it to be posted. Just like using the Pinterest Pin It Button, the Viraltag button allows you to bring up all the photos on any web page and simply click to schedule one or multiple to your social networks. You can even use this button to schedule your repins. You can also search Instagram with Viraltag and regram straight from your dashboard. Just search for a keyword or a hashtag. Then select the photo you want to regram. The original caption will automatically be added to your description along with the user’s handle who shared it. See what Viraltag can do for your business. Sign up for a free 14 day trial. Viraltag offers a variety of plans depending on your needs and size of your team. The blogger plan is $12 a month for one team member to connect up to 3 social accounts. The Professional Plan is $29 a month for one team member to connect up to 10 social accounts. The Business Plan offers team workflows for up to 3 team members and is $99 a month. Have you used Viraltag? Let me know what you thought in the comments below! Stay tuned for future features where I explore some of the other options I mentioned at the beginning of this post. I have never used Viraltag. I will have to check it out. I’ve never even heard of it, but it sounds very interesting.Right now, however, I don’t make any money from my blog. And although I know sometimes you need to spend money to make money, I’m still just researching and considering what it is I really want to do with my blog. I really appreciate the in-depth review! I hear you! I actually don’t make much from my blogs. For me it’s more of a creative outlet but I am really time crunched so it’s helpful to have time-saving tools. Oh, and good luck deciding what you want to do with your blog! I actually was making money from my blog before I rebranded and stepped back for personal reasons. That’s the great thing about blogging, it can be whatever you want it to be!